After two days of qualifying, the field is set for Sunday’s Carolina Nationals, the first race of the NHRA’s six-race championship Countdown. 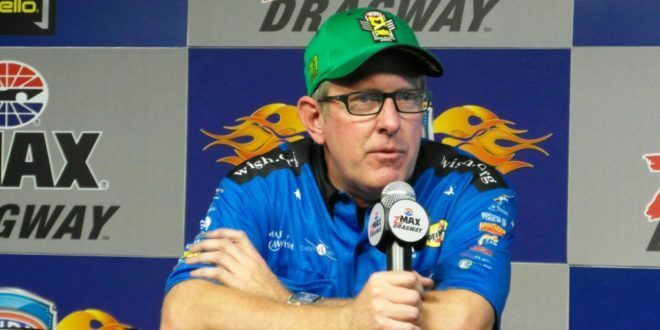 Doug Kalitta made a run at 3.721 seconds at 325.77 mph during Friday’s second session late in the day that held through Saturday to take the top spot in Top Fuel heading into Sunday. Kalitta’s team does not traditionally run strong in the later part of the season, something they are hoping to change this year. Tommy Johnson, Jr. grabbed the top spot in Funny Car on Friday night and, like Kalitta, the hot weather for Saturday’s sessions played in his favor. Johnson’s 3.876 at 323.43 mph held through the final two rounds, giving him the No. 1 spot. Greg Anderson, meanwhile, came out in Saturday’s first session and took advantage of some lingering cloudy weather to snag the top spot from teammate Jason Line, who was provisional No. 1 after Friday. Anderson ran a 6.578-second pass at 210.50 mph to bump Line down to second. Pro Stock has been the KB Racing show for much of the season, until performance from the team seemed to slide over recent weeks. Turns out with a points reset on the horizon, the team was taking the opportunity to test some things for the championship run, a strategy that might pay off from early indications as two of the three team cars hold the top spots in the class. 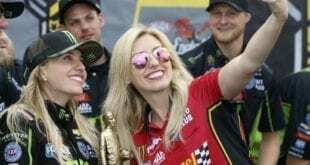 Erica Enders, defending Pro Stock world champion, failed to qualify for the event, the first time she’s failed to qualify since 2010, and will not race on Sunday in the opening round of the championship Countdown. Enders and her Elite Motorsports team battled mechanical issues and were not able to make a competitive run, finally suffering an engine failure in their fourth and final try. In Pro Stock Motorcycle, Angelle Sampey earned some qualifying points toward her quest to win her fourth championship by coming away as the No. 1 Pro Stock Motorcycle qualifier. Sampey put down a 6.815 in the first Saturday session that held through the final qualifying round. Tags Angelle Sampey Doug Kalitta Greg Anderson Tommy Johnson Jr.